Tall Square Vase, Tangerine Aluminum Wire, Foliage: Galax Leaves, Variegated Pittosporum, Bicolored Circus Roses, Purple Monte Casino Aster, Orange Tulips, Yellow Alstroemeria, Orange Gerberas, Blue Iris. Pink Gathering Vase, Ribbon, Foliage: Salal, Leather Leaf, Pink Roses, Purple Larkspur, Green Button Poms. More than your average dozen roses, Young Love is created for the young at heart. 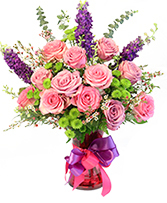 Green button poms are snuggled with light pink roses while purple larkspur rises to greet the one you love. For love of all kinds, this design will always shine. 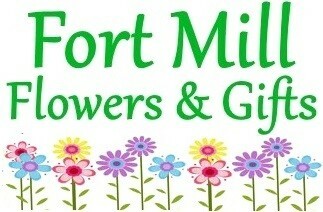 Tall Square Vase, Foliage: Seeded Eucalyptus, Hot Pink Gerberas, Blue Iris, Yellow Tulips, Yellow Button Poms. 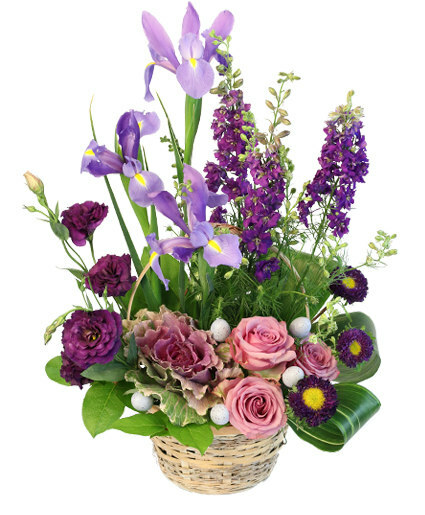 Enjoy the bright colors of Spring this Easter! 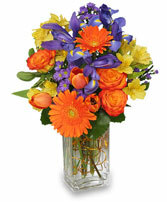 Spring Smiles pops with bursts of color from pink gerberas , yellow tulips, and blue iris. Great for a hostess gift or to bring a smile to their faces from far away.